Design is what we breath here at Parsons; design, that is as much in the process of “cleaning and reorganizing a desk drawer” (Victor Papanek), as it is in the makings of synthetic biology and 3D food printing. Now that the academic year is upon us, I’d like to reflect on everything that we’ve so far accomplished. This year, students with backgrounds as variable as their places of origin (India, Germany, Egypt, Canada, US, China, Great Britain) have joined Design Studies in continuing the tradition of diversity that has characterized the program since its inception three years ago. Our new students bring experiences and knowledge from the fields of philosophy, art history, media, marketing and, of course, design practice. They are here to engage critically with design, as both intellectuals and practitioners, to bridge theory with practice, to develop their own distinct pathways through elective course choices across The New School and to undertake their capstone work in the second year of study. Our incoming students’ orientation took place in the third week of August. As an initiation to the discourses in which students will be enmeshed in the next two years, we visited two different sites of design, the Navy Yards and the Cooper Hewitt museum: the first, a site of design production, where future designed worlds are being conceived and manufactured; the second a site of display, education and curation. 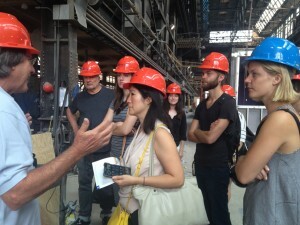 In the first, we were guided by architects Christian Huber and Vivian Kuan, both associated with the studio Terreform ONE (Open Network Ecology). Christian and Vivian took us on a tour at the modular homes construction company Capsys, a realization of the metabolists’ and other utopian architects’ dream, where homes are constructed in a factory setting indoors to be transported and plugged in or assembled on location. We also visited the Terreform ONE’s own studio where biology meets urbanism in fascinating experimental work such as the Urban Farm Pod, that integrates ideas of urban agriculture with the growing of architecture as food. 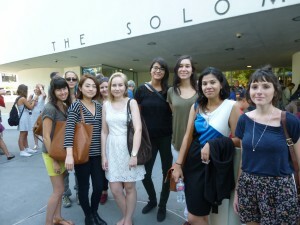 The second stop during orientation was the Cooper Hewitt, a site of display, education and curation. Here, we were guided by History of Design and Curatorial Studies student Sakura Nomiyama, who discussed with us selected exhibits of the “How Posters Work” exhibition, while pointing out innovations in the early 20th century mansion of the Carnegie family that houses the museum (its elevator, air-condition, and heating system), which is easy to take for granted a century later. This house was as much a masterpiece of engineering innovation back then, as the Urban Farm Pod is of urban agricultural innovation today. 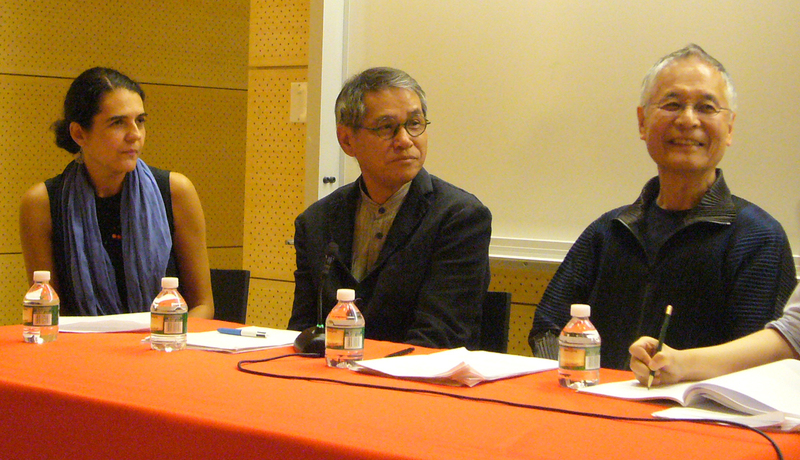 “Japanese Design Today,” Q & A session, Kashiwagi Hiroshi, Nakamura Yoshifumi, Jilly Traganou (right to left). Co-organized by The Japan Foundation, New York; MA in Design Studies; MFA in Industrial Design, Parsons New School of Design, at The New School, September 2015. On September 8, in collaboration with the Japan Foundation, New York and the new Parsons MFA program in Industrial Design we hosted the event Japanese Design Today: Unique, Evolving, Borderless. The event included two lectures, the first by Kashiwagi Hiroshi, a prominent design historian of Japanese design and professor at Musashino Art University, and the second by architect and furniture designer Nakamura Yoshifumi, a professor at Nihon University. In his lecture Professor Kashiwagi examined the characteristics of contemporary Japanese design (craft, minimal, thoughtful, compact, cute), while Professor Nakamura’s lecture focused on his architecture of hut dwellings, residences of energy efficiency and minimum size that function as retreats for everyday life. After the lectures I was moderator of a conversation on the state of Japanese design today, which opened up questions on nationalism and otherness in today’s Japan, as well as of the role of materialism in everyday life. Having been a Japan Foundation fellow in the past, and admittedly a Japanophile, I hope that the event has inspired our students to look into future research and funding opportunities offered by the Japan Foundation and other sources, which would allow them to research the role of design and material culture in Japan. We also hope that we will continue our collaboration with the Japan Foundation, who has already co-organized and supported several events with Parsons, such as for instance the Kon Wajiro exhibition on design ethnography in March 2014. Continuing a guest-Professor sequel that began with Peter Hall earlier this year, in September 14-25, we hosted Albena Yaneva as Visiting Professor at Parsons. Albena Yaneva, a Latourian anthropologist, is Professor in Architectural Theory at the University of Manchester. 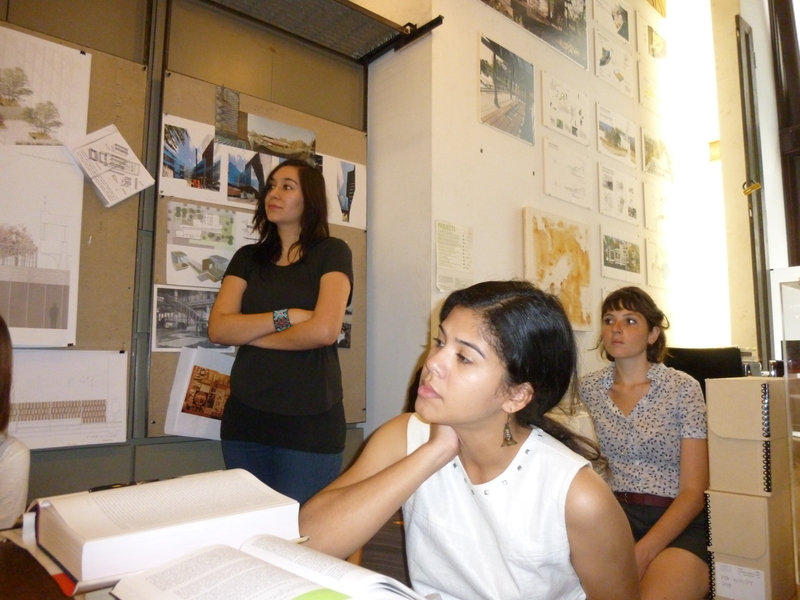 Albena taught an intensive elective class titled “Ecologies of Practice: An Anthropological Approach to Design” that attracted students from across the New School. She also met individually with PhD students in anthropology, and gave two lectures, one in the anthropology lecture series and one in my Advanced Thesis Preparation class for the MA program Theories of Urban Practice program. 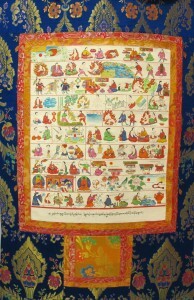 Her lectures focused on the concept of cosmopolitical design—the subject of her forthcoming book with Ashgate, an approach to design that takes into account both the material and the living world, and entities with differing ontologies: viruses, natural disasters, climate, carbon dioxide, floods, rivers, and so on. 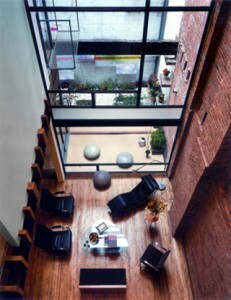 Comsopolitical design can be seen as much in the work of contemporary architects grappling with the problem of the sun glaring in the glass facades of their buildings, as in the work of environmentalists who take care of natural ecosystems trying to balance people’s engagements with nature with acts that regulate ecology and allow nature to “recover.” Albena was a valuable resource for our students who had the opportunity to develop in-depth case study research and writing in her class, utilizing ethnography and developing a pragmatist approach to the understanding design and what it does in the world. On September 25-27, a group of 14 students and myself attended “A Better World by Design,” a conference organized by students of Brown University and RISDI in Providence, Rhode Island. Besides giving us the opportunity for critical conversations on design and its impact in the world, we enjoyed several of the lectures, such as the one by Alexis Lloyd, Creative Director of the R&D Lab of The New York Times, and a Parsons alumni, on the role of computational systems and the way they can become tools for conversation, an issue which resonates with several of our students’ capstone research. 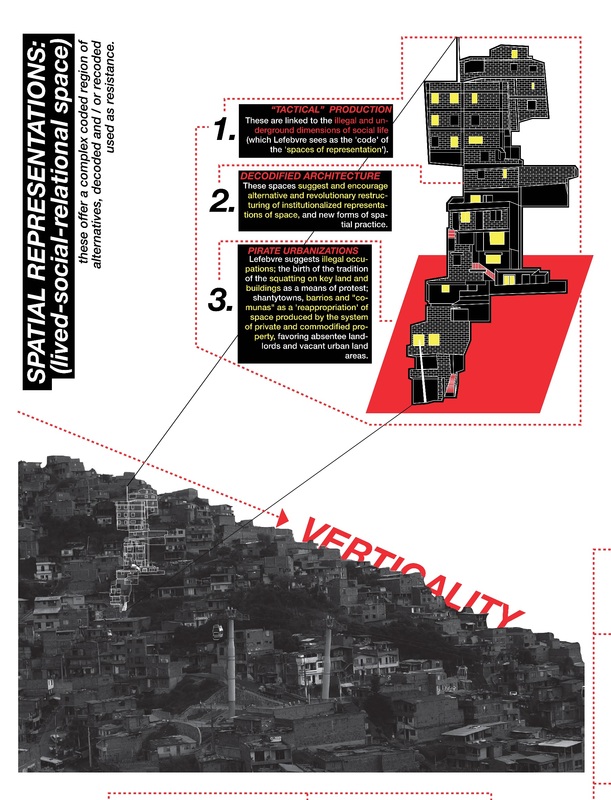 “Spatial Representation: Verticality,” visualization of MA Design Studies student Juan Pablo Pemberty’s thesis titled: “The Spatial Conjunction: Design Redress and the Social Urbanism of Medellin,” submitted May 2015. On September 30, ADHT participated in the Parsons Career Expo. We were happy to have work of two of our MA Design Studies alumni, Niberca LluberesRinicon and Juan Pablo Pemberty, presented at the ADHT table, as well as the last issue of Design Studies magazine Plot(s). After the divergence and excitement of the first two months we are now converging our energies into the end of the semester. Many things are up in the ether but I hope it will not be a spoiler if I tell you that our students are Plotting again, and a call for proposals is in the works. We look forward to a productive year! The MA Design Studies program welcomed its third cohort with a series of Orientation events designed to introduce everyone to Parsons, the New School, and New York City; and, most of all, to get to know each other a bit before diving into classes. The week began on Monday, August 18th, with official welcomes, followed by informal introductions, toasts, and a wide-ranging conversation with professors Clive Dilnot and Jilly Traganou at Director Susan Yelavich’s loft in Soho. Appropriately for a program that explores values and ideologies embodied by design, on Tuesday we visited the Guggenheim Museum for a guided tour of Italian Futurism, 1909-1944: Reconstructing the Universe. Left to right: Micki Unterberg, Anke Gruendel, Soohee Cho, Gene Duval, Sonja Holopainen, Laura Sancez, Estefania Acosta, Quizayra Gonzales, Laura Belik. 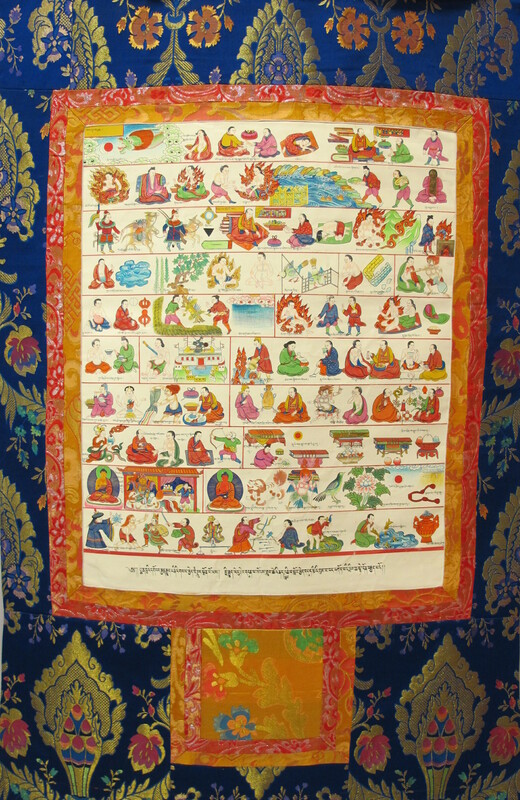 On Wednesday, Bodies in Balance: The Art of Tibetan Medicine at the Rubin Museum of Art offered a contemplative respite in the middle of a week of concentrated informational meetings with librarians, archivists and student services administrators. The day after exploring bodily health at the Rubin, we shifted gears on Thursday and looked at how design can contribute to the health of the city and its residents. We were hosted at the loft of Marpillero Pollak Architects in Tribeca, by MAP partner Linda Pollak, who shared insights into how she and her partner Sandro Marpillero approach the design of urban open spaces in conjunction with residential architecture, museums, and cultural institutions. 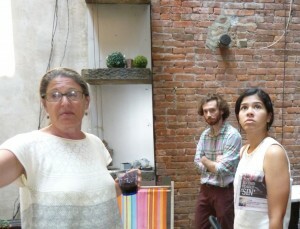 After a conversation that ranged from the efficacy of New York City’s project to plant a million trees to designing for differently abled bodies, we were treated to a tour of MAP’s live-work loft with its own unique network of open spaces. Thoroughly saturated, but with a better sense of each other and the program they’ve embarked on, the Class of 2016 closed out a week by celebrating with all of the other new MA and MFA students at a reception on Thursday evening at Parsons—a reception that marked not just the end of Orientation but the beginning of a host of exciting new academic trajectories. 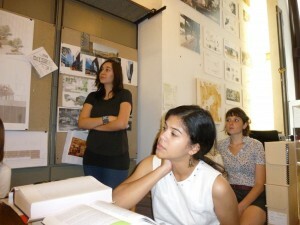 Left to right: Estfania Acosta, Quizayra Gonzales, Laura Belik in Marpillero Pollak Architects studio.